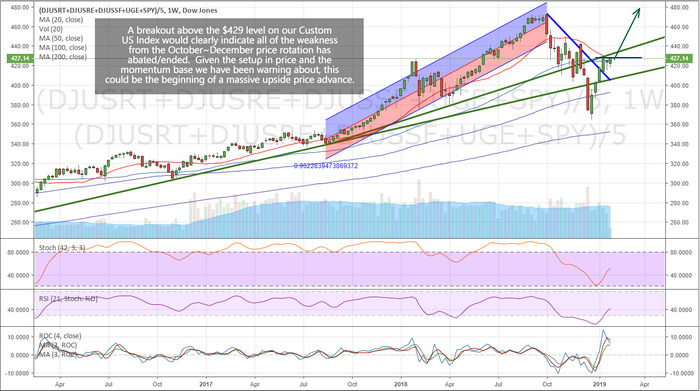 ADP Numbers and the US Fed Hit the Launch Button – Technical Traders Ltd.
Get ready for a potential blastoff in the US stock market as all-stars are beginning to line up for an incredible upside price rally. The Fed, taking a warning from the markets and the global economy, has decided to leave rates unchanged for now. It appears they have moved to a more cautious stance in an attempt to foster continued economic growth over rate increases. The purpose of this is clear to anyone watching what is happening across the planet – the US is the strongest, most mature economy on the planet. The US fed can’t risk creating another debt/credit collapse at this time. It is better to move in measured steps than to move “all-in” over a short period of time. Additionally, ADP released their Jobs numbers for December 2018 today with an expected 271k jobs number. This is an incredible number for December. Our interpretation of December employment numbers is that the Christmas hiring has already ended and many companies are have already shipped/supplied product for the holiday season. By December, we expect to see weaker jobs data with the expectation that firms are downsizing payroll while planning for the Spring sales season to get started. This does not take into consideration the weather events that typically plague December. The only things left for this rally to really blast off would be strong earning data and some resolution to the China trade issues. If either of these “booster rockets” hit the news cycles over the next 30 days, we could easily see the US stock market rally toward all-time highs in a matter of weeks – not months. Pay attention to the way price is setting up and take special note of the fact that the US economy and stock market are really the biggest, and safest location on the planet, right now, for any capital. As long as these numbers keep pouring in like this and the US Fed doesn’t hit the “panic button”, there is a very good chance that the US markets will continue to rally until some type of foreign market event deflates this move. Have you been suckered into shorting this rally over the past few weeks? 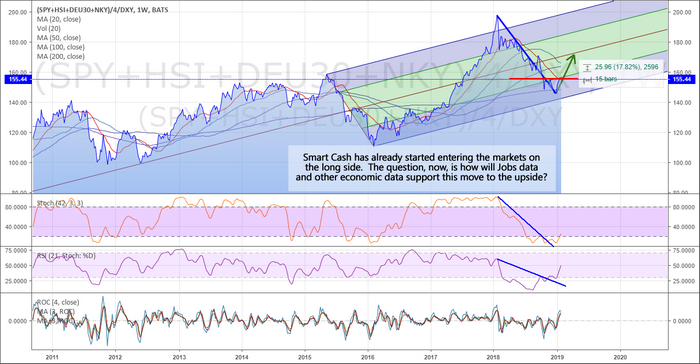 We have been expecting this rally since the end of December and we do feel it will continue to trade sideways or higher for a couple more months, at which time we will need to reevaluate the state of the market. The Feds move was bullish for stocks and it could be enough to send the market substantially higher, but it also means they know the economy is not as strong as they thought and didn’t feel it would be good to raise rates. The chart below shows what could happen if stocks can rally and close above last weeks high. It could spark another run-up in stock prices to new highs. Overall, the stock market is at a critical tipping point much like the December 2000 market top, April of 2008 market top, and the two continuation moves during October 2011 correction and rally, October 2015 correction and rally. What happens over the next couple of months will determine where your long-term investments should be placed. Visit https://www.thetechnicaltraders.com to see how we’ve been calling these moves. We’re not perfect at making calls – that would be completely unreasonable to think we can predict the future 100% of the time. But we are confident that our daily videos, proprietary price modeling tools, and detailed global market research will provide you with the advantage you need to create more success – Join Now!